Grey skies open into rain just as I drive into the parking lot of Butchart Gardens. Oh dear. I grab a clear umbrella from the stack and carry on. The gardens have something to offer at every time of year. Today's stroll provided vistas of quiet green and brown highlighted by thousands of sparkly lights. These photos were taken between 3 and 4 pm so the lights are somewhat dim. Throughout the gardens, scenes from the Twelve Days of Christmas are tucked into corners. One of my favorites is the three French hens, seen above enjoying tea and pastries with a lighted Eiffel Tower in the background. In the mosaic at the top, five golden rings float on the pond. Garlands of cedar adorn pathways and statues, like this elegant bronze horse. 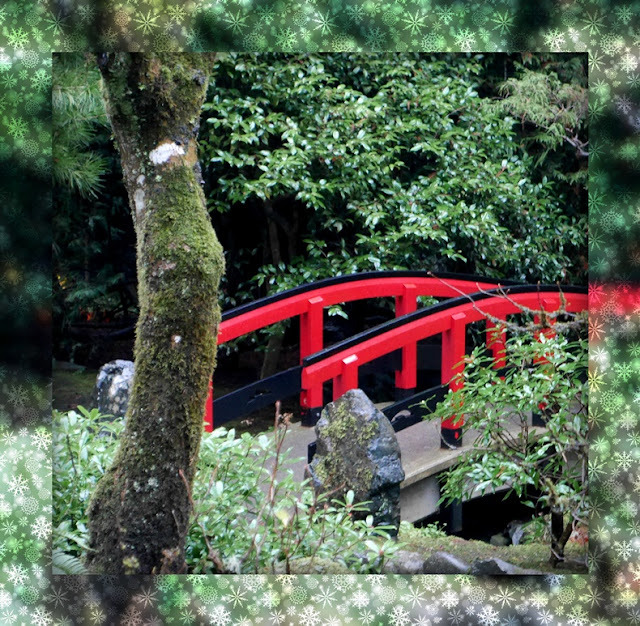 With the help of BeFunky, I can envision the bridge (seen above and below) in the snow. This is likely the only type of snow I'll see this winter, although I always hope for some of the white stuff. Here's another view of the bridge, with true colors and a snowy background frame. This curving path of stepping stones is one of my favorite places in the gardens. Although I ended up with frizzy hair and damp feet this solitary walk in the gardens was perfect for relaxing my mind after one busy week in anticipation of another of the same. How are you relaxing these days? Is is raining or snowing in your corner? That place will always hold a special place in our hearts at this time of year for it's where we visited on our honeymoon many years. It's beautiful any time, isn't it? I've only been to Butchart in summertime - and of course loved it all so much. Nice to see it now in winter and even in rainy conditions I can imagine it still to be a special place to walk, relax and think about life. Lori it's been a really pleasant weekend here again - no need for coats or rainwear and just heard on the news we'll be back in the seventies by end of week - too warm for December for me. We didn't relax this weekend - a concert, some shopping, raking leaves, and today getting out the Christmas stuff and doing the outdoor decorating while the weather is pleasant. Beautiful photos, I can only imagine how wonderful it is in person! Time out of doors even if it's raining is always good I think and those gardens do look enticing. What a lovely idea to use the 12 days of Christmas in decorative themes. The French hens are perfect! How lovely! I wish I could wander through there. Maybe not on a rainy day. We actually had rain the other night which brought with it colder temps. Time for tights and sweaters and scarves. What a lovely garden to visit, shame about the rain. How changeable the weather is, not just for you over the water far away , we had lots of rain last week now it's warm 13 deg so a walk is what i'll be doing after my coffee and hopefully find lots of berries and things I can use to make my wreaths I always put one on our cottage even though we don't have any visitors staying there . Enjoy your week. The gardens are beautiful, even or especially in the rain. Perhaps not the most pleasant way to enjoy them, but the rain makes everything clean, shiny, and glossy. Your photography accents the beauty, too. Love the bronze horse. You must have had a good time. have a wonderful week. 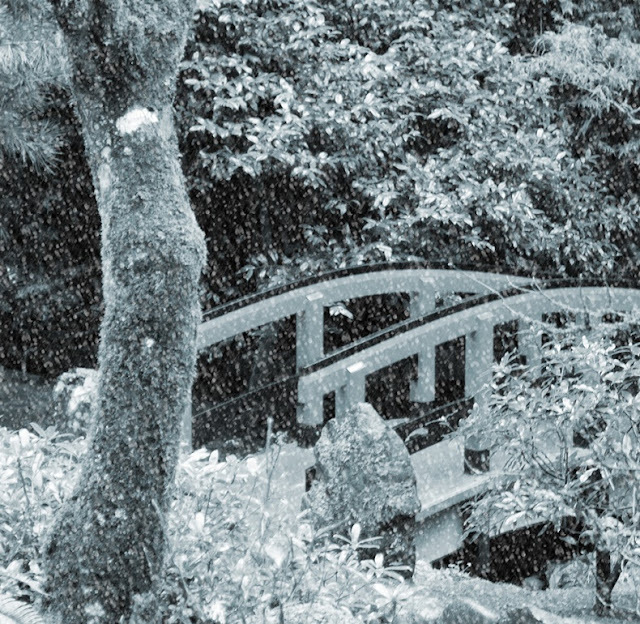 Love that snowy edit of the bridge! If you like you can link it up on this weeks "Through my Lens" Link is below. The Three French Hens are adorable and clever. I think I'd love to walk in this garden, too. Glad you were able to enjoy it,even in the rain. One of our favorite places! Are spending Christmas on the island this year, and plan to visit Butchart for the lights. Love your mosaic! This is such a cool post, Lorrie...I enjoyed every inch & felt like I was walking along with you...sans the rain. I am SOOOOOO glad you posted the photo of the horse with the Christmas wreath!! My DH used to own race horses & we have a bronze type of statue of one, up on top of the den bookshelves. It is pretty big & a looooong time ago, I used to have a dried flower wreath around its neck. That got pitched & I've never thought to decorate the horse for Christmas. You've inspired me!!! Thanks! I loved Butchart gardens when we were out west for an Alaska cruise a few years back. It's nice to see it decorated for Christmas and the five golden rings floating in the water is well thought out. Lucky you to visit the gardens throughout the year. What a beautiful garden and display...I would love spending hours there. It sure is an amazing place to visit. Hello, what a lovely garden. I would like to take a stroll there. The Three French hens and the horse are wonderful. The last shot is gorgeous. Happy Monday, enjoy your new week! What a delight! I haven't been to Butchart Gardens for decades -- all our visits to Victoria are too directed, leaving little time for such charming extras. I love! those French hens. Thanks for taking me to the gardens -- perhaps one day, I'll get a chance to visit them myself. I loved seeing the garden in the rain. We visited there for our 25th anniversary…we had free plane tickets for as far as we could go on our continent so there we were. And now you are into your next busy week. How good of you to be intentional about taking time for yourself. And I like your new header. Your photos are breathtaking, my friend! The hens gave me the giggles - too cute! May you have a joyous week. Hugs! The three French hens made me smile. 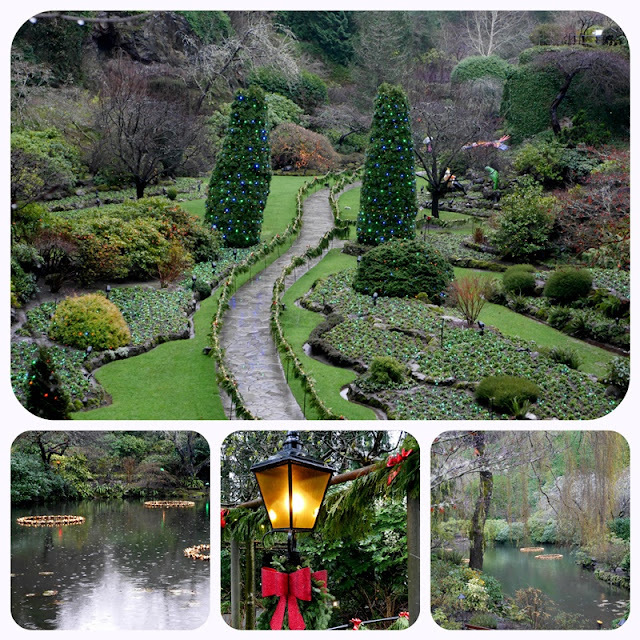 Thank you for sharing this fun tour of Butchart Gardens at Christmas. I am in love with your walk in the gardens in the rain. How I would have loved walking with you. Today I finished decorating, except for some fresh greenery and flowers; so now I can relax a bit, turn on the Christmas music, sit and read while sipping a cup of tea. Only two more gifts to buy and then that will help too. I am totally looking forward to doing a little baking and fluffing. What fun - even in the rain. I love the idea of the 12 days of christmas throughout the gardens. It is my favorite christmas theme - I have all sort so decorations related to that song. We have our decorating done for the year - now we can bake and enjoy the time with family and friends. You are so fortunate to live so close to the gardens - for us it is a ferry trip up from Bellingham - and an overnight stay - so we haven't gone in years - I love that you share the gardens with those of us who can't go all the time. Thank you. Oh this is just beautiful Lorrie. I love the 3 French Hens! How fun they are. We are enjoying sunshine and above freezing (and normal) temperatures this week. The snow is melting even more and will be gone by the weekend I think. Feels like spring. :) I only wish. I think your frizzy hair and damp feet were worth it for the visit to the Gardens. Thanks for sharing. Nothing but rain here! I love the different seasons of the garden. So pretty in different ways. Oh how lovely...rain or not! I would love to walk through the gardens at this time of year. Maybe we need to make a trek out to Van Deusen Gardens one of these days. That first photo looks like out of a movie. These gardens are gorgeous. We have a lot of rain in our forecast and you have given me the idea to visit our nearby Japanese Gardens in the rain. Spending as much time outdoors during December is always priority. I truly need to breathe the cool air and listen to the quietude. Oh Lorrie there is so much seasonal goodness in this post. I loved the chickens! The magical train ride brought back lovely memories for me when my guy was that age. Precious.